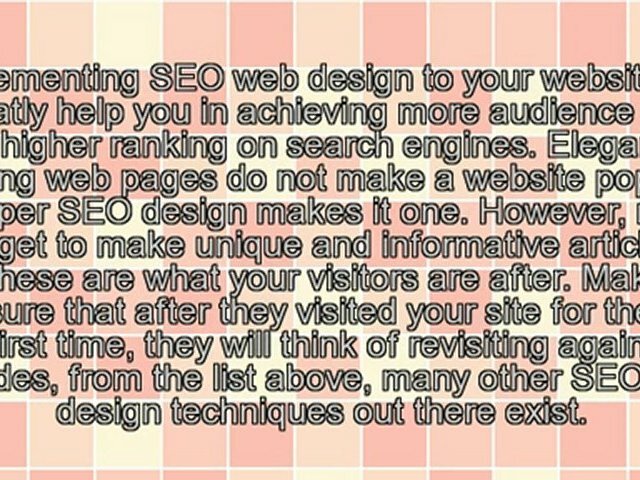 One of today’s most popular design trends harks back to the art and science of yesterday’s medical world. Apothecary style is inspired by the delicate green and amber bottles of Renaissance apothecary shops, the colors of drying herbs in a wise woman’s cottage and the bold lettering on the sign for a 19th century medicine show. 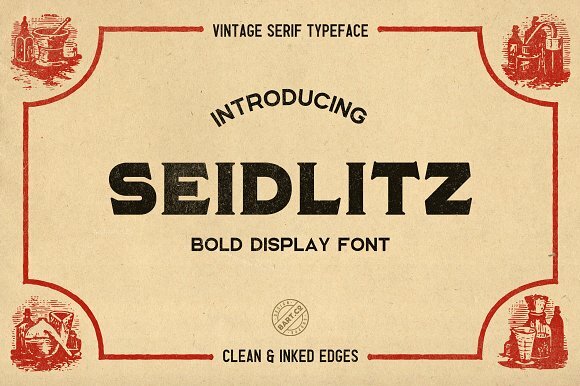 This unique vintage look is reflected in design projects ranging from signage to product packaging and invitations, and it even inspires room décor and wallpaper. The apothecary’s art was also co-opted by the famous “snake oil” and “Patent Medicine” salesmen who hawked strange potions from the wagon of a traveling medicine show. All of those influences combine with other vintage elements to form the basis of an aesthetic that captures both the precision of science and the rustic charm of plants, herbs, and flowers. Apothecary style features muted colors such as amber, sepia, pale greens, and lavenders. These are the colors of vintage medicine bottles and the plants and flowers used to make potions of various kinds. Shapes reflect the blocky look of old bottles and pots used for salves and ointments. Apothecary design also incorporates vintage illustrations of plants, flowers, and other natural patterns in ink and watercolor. Apothecary design includes both the mystical and occult and the austerely scientific. It can lend an air of precision and quiet authority to business branding, or add a dark and magical feel to party invitations and signage. 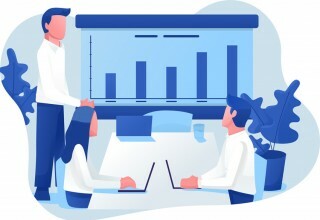 The trend appears in projects such as product packaging for premium health and beauty products, soaps and herbal remedies as well as quality whiskies and other spirits. Apothecary style can also add a retro look to t-shirts and other kinds of apparel. 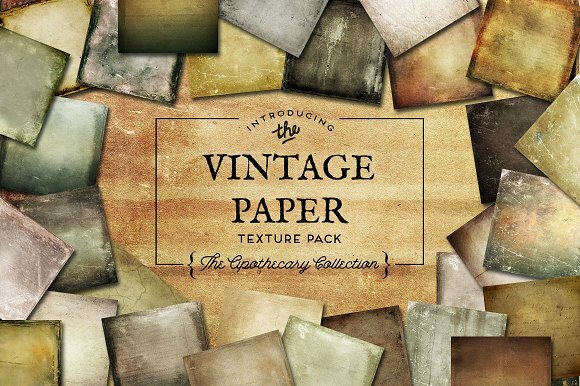 The Vintage Paper Textures Apothecary set includes 40 layered paper textures with a dark, medieval feel. The paper textures feature stains, scratches, burned edges, and faint script lettering for an authentic look, plus a set of rose images in various hues. Each paper comes in an individual JPG file at 300 dpi for use as photo overlays and backgrounds for apothecary-themed design projects such as book covers, flyers, and packaging. 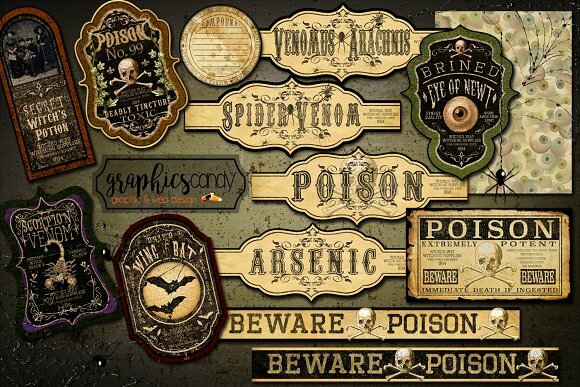 This Halloween Apothecary Label set combines vintage lettering and textures in a set of spooky labels for use on bottles, jars, cards, and even candy wrappers. 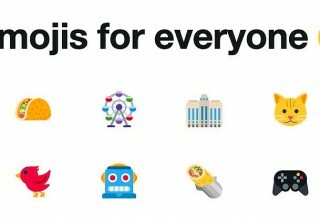 The set includes 12 labels as a transparent PNG file, plus 4 print ready sheets with labels in an assortment of different sizes. The Halloween Apothecary Label set also comes with a bonus Eye of Newt decorative background sheet for an extra witchy feel. 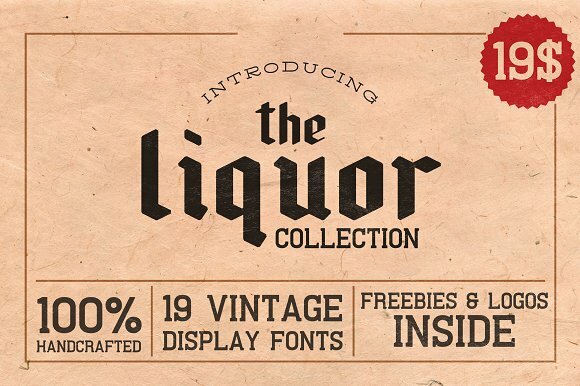 The Liquor Collection Font Pack includes 19 vintage display fonts inspired by retro fonts used on vintage liquor labels, posters, and advertising. 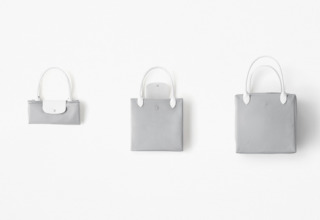 The set contains three fonts that can be purchased separately plus a set of four fonts exclusive to the collection. 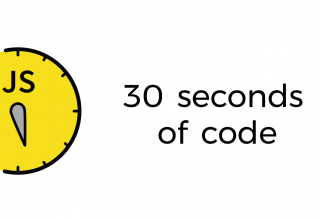 All fonts come in styles including clean, rough and beveled, plus free extras. The Liquor Collection also includes 15 vintage logo templates showing how fonts can be used for display, posters, and logos. The Apothecary Display Font is inspired by the apothecary’s blend of botanical and chemical ingredients for creating remedies. 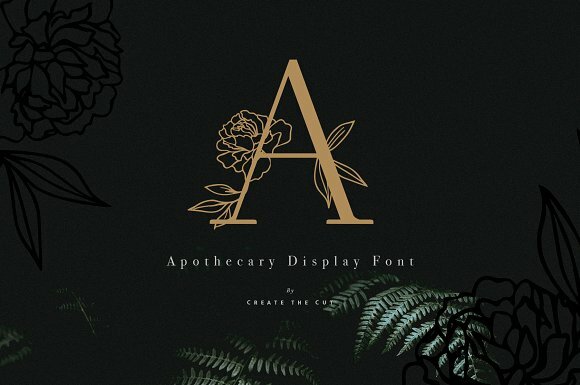 The Apothecary Font features elegant display capitals with floral embellishments for use in headers, invitations, posters, and sophisticated branding. The font set also includes a display alphabet with a rose gold foil effect and original line artwork. 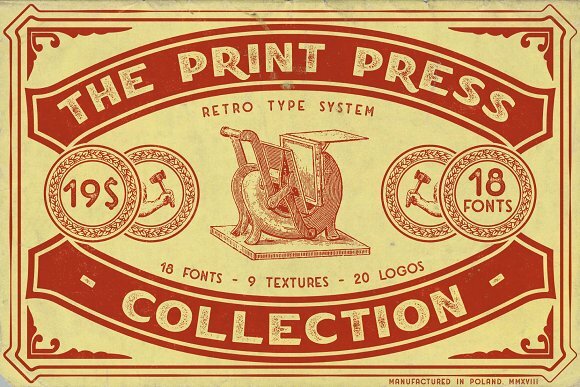 Inspired by vintage typography from posters, banners and advertising, the Print Press Collection includes 18 fonts in 5 different typeface families for use on posters, labels, t-shirts and branding design. 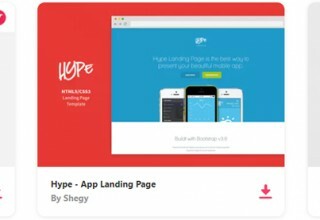 The Collection also includes 20 vintage logo templates and 9 vintage halftone textures in both vector and raster formats. 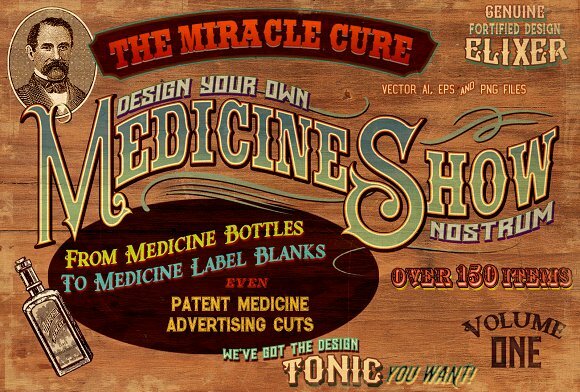 The Medicine Show Kit is a collection of rare, authentic “Patent Medicine” ephemera, carefully restored from the original images and converted to high resolution scalable vector images. The Kit contains over 195 product and advertising images and phrases from actual signage used in mid-18th century medicine shows. 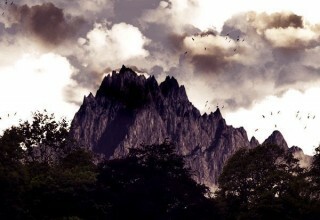 All images are copyright-free and ready to use on posters, apparel, mugs, cards, and product packaging. 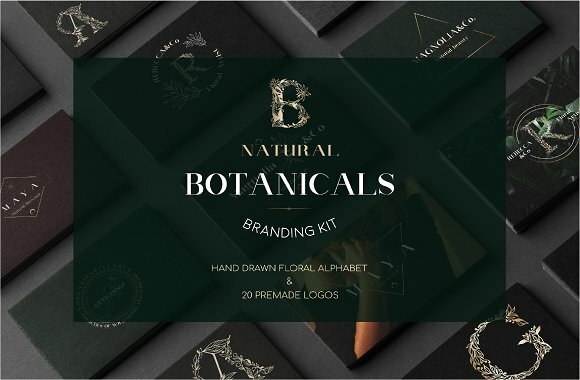 The Natural Botanicals Branding Kit is a complete kit for businesses in fields such as photography, cosmetics and beauty, wellness and lifestyle blogging. The kit includes 20 fully editable logos plus a hand drawn vector floral alphabet and free fonts for use in creating cards, social media profiles, advertising, and other branding materials. 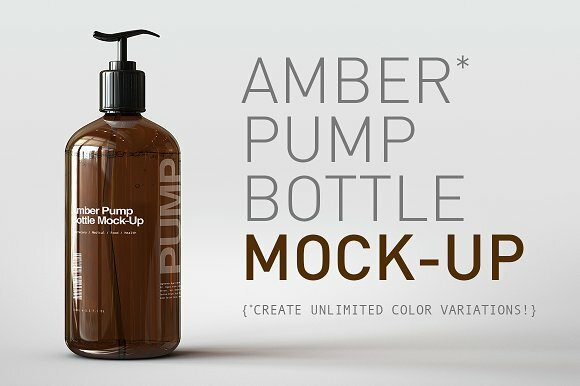 Based on the design of vintage medicine bottles, the Amber Pump Bottle Mockup features a high gloss reflective amber pump bottle that can be fully customized, including adjusting the reflection intensity. 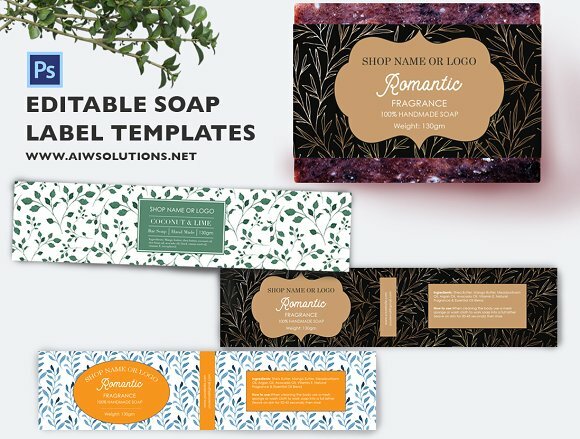 The mockup includes 6 high-resolution Photoshop files with Smart Layers for replacing label art for use in beauty, wellness, healthcare, or salon product displays. 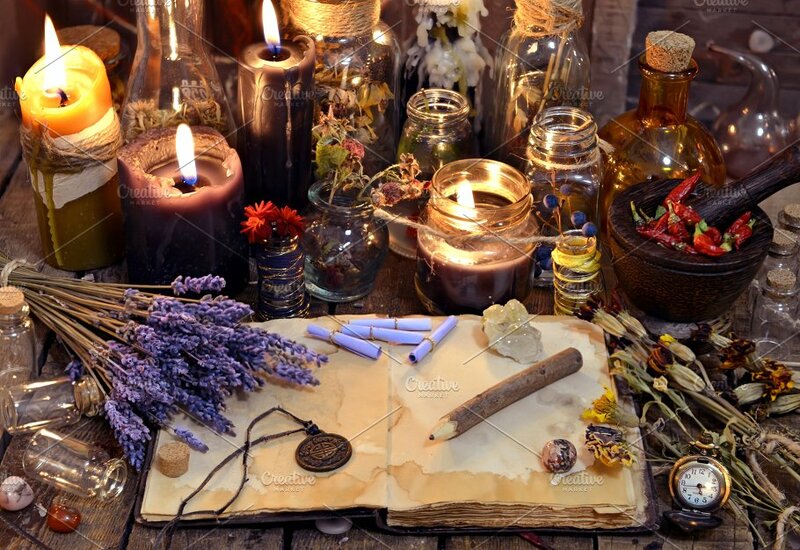 Reminiscent of a witch’s workroom or a healer’s hut, the Old Apothecary Concept With Book is a complete background image featuring an old open book surrounded by candles, potion bottles, bundles of herbs, and a variety of magical objects. This vintage background image can be used for posters, book covers, prints, and other products with a mystical, vintage look. 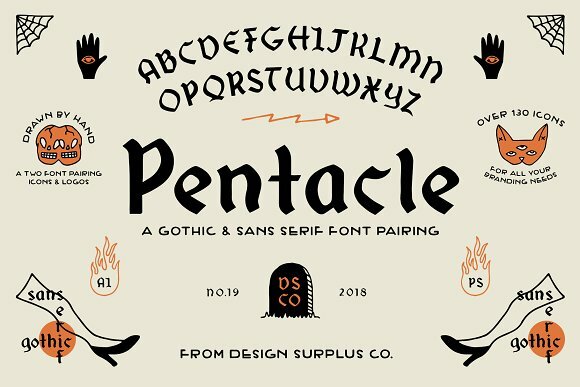 Pentacle is a Gothic and sans serif font pair with a witchy, vintage feel for use in Halloween cards, flyers, posters, and product packaging. The Pentacle Font collection also comes with over 130 spooky icons including skulls, black cats, occult images, and tombstones. 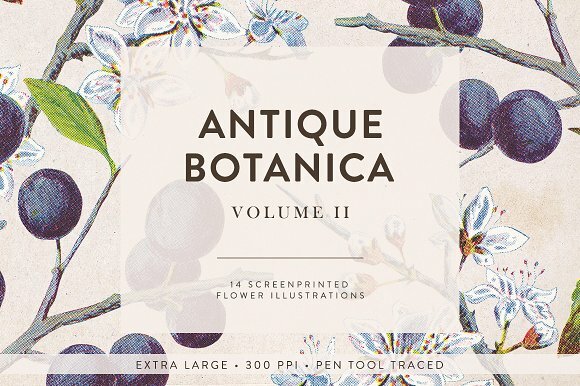 Vintage Flowers Vol 2 from Greta Ivy features 14 screen printed floral illustrations from the 1900s. 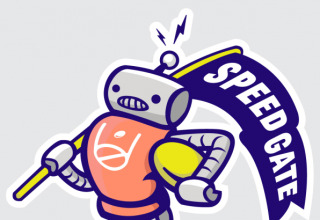 Backgrounds have been manually removed using the pen tool for crisp edges for use on both light and dark backgrounds. This Vintage Flowers set comes in large PNG files for use on prints, wedding invitations, posters, packaging, or brand design. 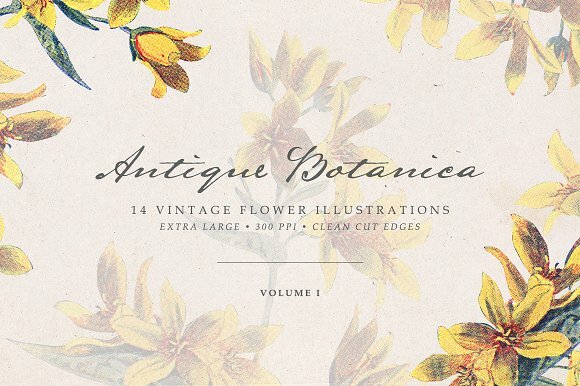 A companion to Vintage Flowers Vol 2, this Vintage Flowers set from Greta Ivy includes 14 vintage flower illustrations from the 1900s with backgrounds manually removed. All images are available in extra large, high-resolution PNG files for use in art prints, wedding invitations, posters, packaging, collages, and web design. The Old Apothecary Concept is an apothecary themed variation on the Old Apothecary With Book Concept. 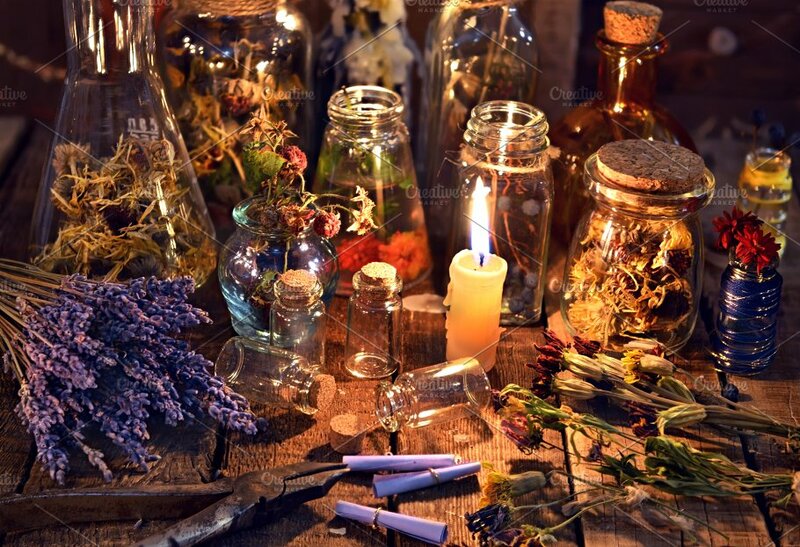 This high resolution background image features candles, apothecary bottles and pots, herbs and flowers along with other magical and esoteric objects for use in posters, book covers, and prints. 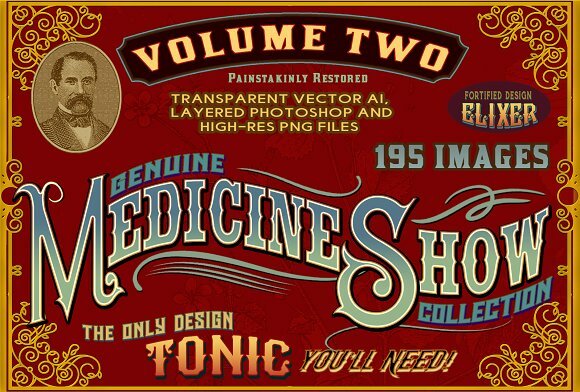 Like its companion, The Medicine Show Kit Vol 2, the Medicine Show Kit Vol 1 is a collection of authentic patent medicine ephemera, restored and recreated as high-resolution vector and raster images for use in branding, posters, prints, and packaging. 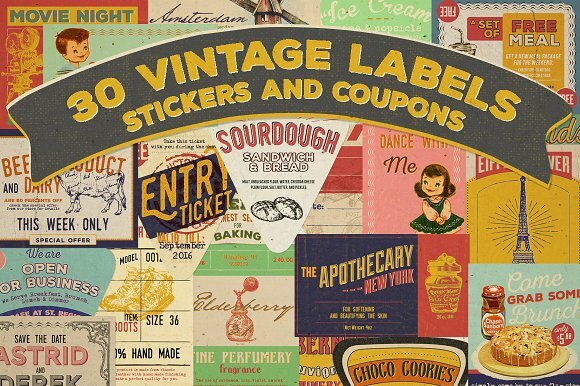 The kit includes vintage woodcut, etched and hand drawn bottle images, advertising cuts, logos and labels, plus a large set of words and phrases from vintage medicine ads and labels. 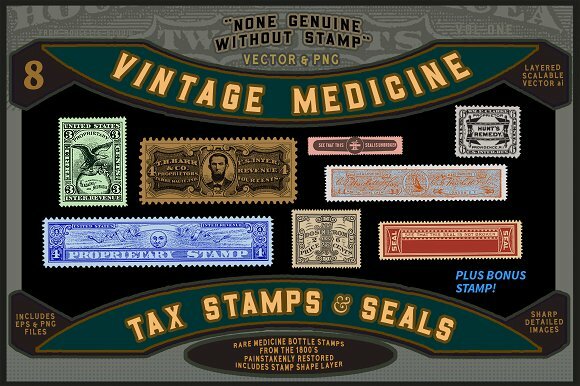 The kit also includes a background “Traveling Medicine Show” image and Medicine Show kit logo. 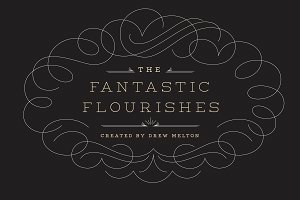 Inspired by old pharmacy bottle labels, the Bohemian Alchemist Font is a completely hand draw font that combines a variety of styles and lines for use in logos, labels, branding, posters, and packaging. 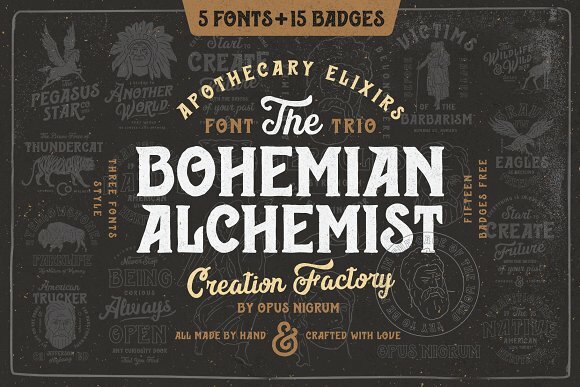 Bohemian Alchemist features three caps styles and two script styles, and also comes with a set of badges, shapes and lines in fully editable Adobe Illustrator files. 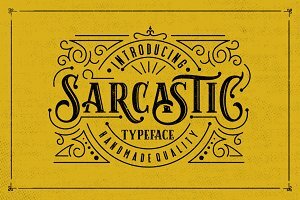 The Apothecary Collection Font Pack is a bundle of sans serif and serif display fonts inspired by vintage medicine labels and druggists’ signs and books. 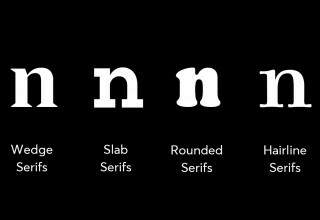 This collection contains 5 fonts in clean and rough styles for use in posters, packaging, branding, and signage. 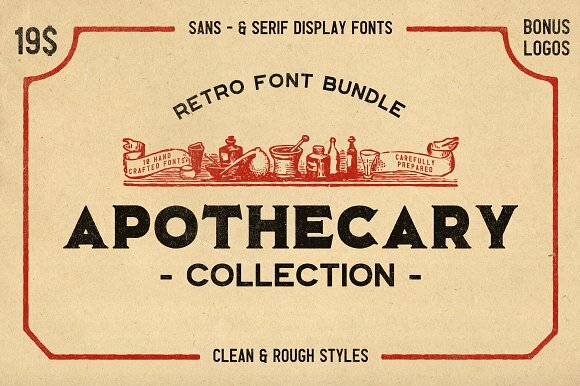 The Apothecary Collection Font Pack includes language support for many European languages and also includes a set of 15 vintage logo templates. With fonts, colors and forms inspired by early apothecary shops, medicine shows and patent medicine, apothecary style combines elements of science, magic, and the natural world for a unique vintage look.